JoJo Siwa is a popular American singer, dancer, actress and personality among young girls, best known for appearing on Dance Moms for two seasons. Since appearing on the well-known reality series, JoJo has become an icon, projecting a positive message of individuality to girls everywhere. This handbook journal is great for young girls who want to express their personality and creativity. A colourful and interesting secret journal for children to write everything about themselves. Share all your secrets and dreams in the pages of this journal. This sticker book will be much-loved by her fans, with over 250 stickers to use colouring and activities to complete! A fun and interesting colour, sticker AND activity book all in one! This will surely keep young girls entertained for hours. This activity book is packed with super-cute colouring and paper craft activities that will inspire Siwanatorz everywhere! Includes colouring pages, posters and paper craft activities with templates. This activity book is packed with awesome craft ideas and activities to make your life extra sweet! This sticker activity book is packed lots of stickers and fun craft ideas. Includes yummy recipes, awesome crafts and load of JoJo inspiration. Includes paper templates to make and create..
JoJo Siwa is a popular American singer, dancer, actress and personality among young girls. And bows are her super power! 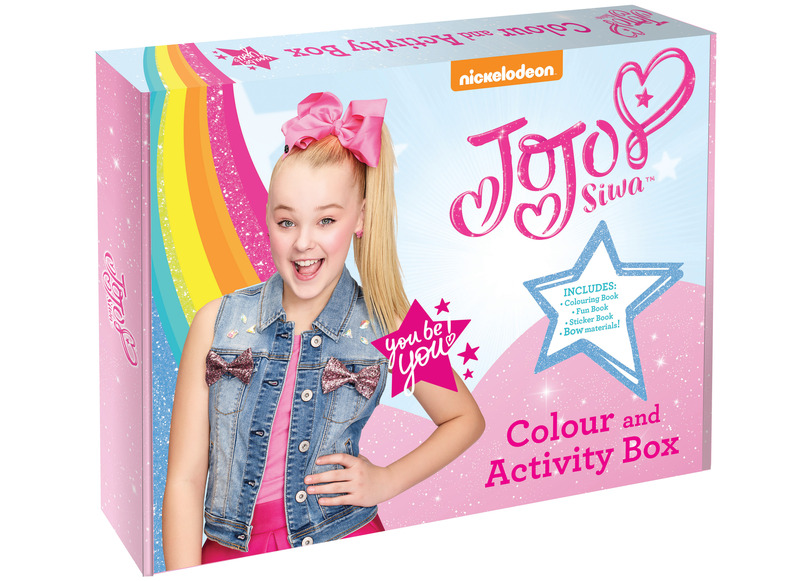 This activity box includes materials to make one JoJo bow, a 24-page colouring book, a 16-page sticker book and a 24-page fun book, which includes instructions to make your bow. Children will love this giant activity pad, which features loads of pages to colour! Included are several pieces of black line artwork to colour and decorate, as well as a few fun activities to entertain and delight. JoJo Siwa is a popular American singer, dancer, actress and personality among young girls. And she presents a positive message to all young ages. This handbook journal is great for young girls who want to express their personality and creativity. A 24-page activity book, which includes instructions on how to make the exclusive bow you can add to your new tree!